Plumbing and piping plans clearly display where the fixtures, pipes and valves are. 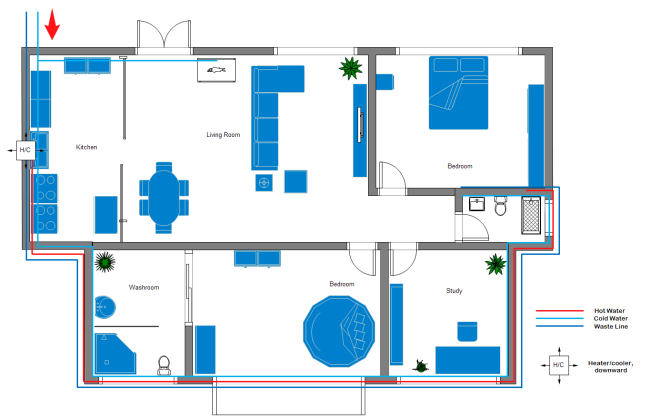 Plumbing and piping plans are of great importance when you design a house or building plan. Plumbing and piping plan design guide offers you useful suggestions to design wonderful plumbing and piping plans. Many people always think it too difficult to make plumbing and piping plans. But if you have truly understand four types of plumbing and piping systems we listed below, and we believe that you can quickly and easily make plumbing and piping plans soon. A home's plumbing system is a complex network of water supply pipes, drainpipes, vent pipes, and more. Because plumbing is complicated and one of the costliest systems to repair or install in a home, it pays to understand how the system works. Water plumbing and piping supply system delivers the water to showers, toilets, bathtubs, and appliances such as the water heater, washing machine, etc. The equipment for this delivery and distribution is essentially a system of water pipes, fittings, service valves, and faucets. These pipes and other fittings are commonly made of plastic, copper, or galvanized iron. Drain-waste-vent (DWV) system is one of the most crucial plumbing and piping system. The job of the drain-waste part of the system is to carry waste water and sewage from sinks, bathtubs, showers, toilets, and water-using appliances such as dishwashers and washing machines and deliver those wastes to the septic tank or public sewer. The pipes of the DWV system are usually out of sight, hidden in the walls, beneath the floors, and in the attic. Most kitchens have a fairly simple plumbing setup that includes hot and cold water supply lines to the faucets; a waste line for the sink (s); and, for kitchens with a gas range, a gas supply pipe. Many kitchens also have hookups for a dishwasher, disposer, ice maker, and/or instant hot water, but these are generally tied in to the sink's plumbing. The bathroom plumbing and piping system must handle water delivery to and waste removal from all of these fixtures in an organized, efficient, leak-free manner. Two plumbing systems are needed to handle a bathroom's plumbing needs: water supply and drain-waste-vent. If you have chosen the right plumbing and piping plans software you find that making plumbing and piping plans has never been easier. Below are the steps to make plumbing and piping plans, which will surely be of great help when you use the plumbing and piping plans software to make your own plumbing and piping plans. 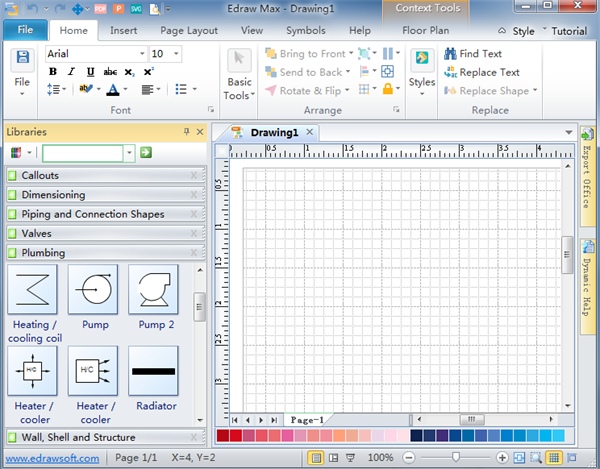 From "Templates", double click the "Plumbing and Piping Plan" to start the drawing page. On the left of the canvas, in the library many standard plumbing and piping plan symbols are available to use, which shall greatly facilitate your drawing of plumbing and piping plans.